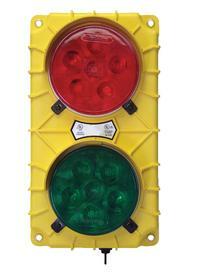 Our Dock Traffic System has red and green lights that help prevent accidents and injuries by providing clear communication between dock personnel and truck drivers. Built-in eyebrow type sun visors increase light visibility. LED model never needs bulb replacements. Deluxe, Model V-DTS-10 (Pic. 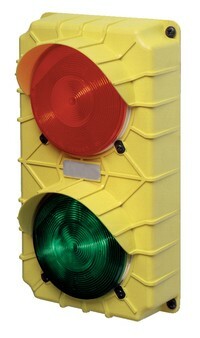 1) - consists of one yellow aluminum traffic light with both a green and red lens, one push-button station (for outside), and an illuminated push-button control (for inside). Light measures 11"W x 20"H and features an 8" hood over each lens (recommended for west and south exposure). 60 Watt. 120V AC. Four procedure signs are included. Economy, Model DTS-5, (Pic. 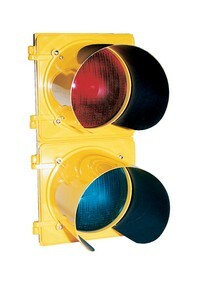 2) - comes with two yellow polypropylene traffic lights, 6 1⁄2"W x 11 1⁄2"H, each having a green and a red lens. The light containing a push button is placed inside the dock area for the dock attendant, and the other is to be placed outside for the truck driver. Four signs are included.